A great turn out on this very wet and windy evening, Thank you to all who made the effort to attend. We started with a show and tell and we viewed some beautiful work from not only our established members but also many items from our new members, thank you. Catherine Lawes was our speaker this evening. Catherine is a Textile Artist from New Zealand. Catherine showed us many pieces of her work which have been inspired by her time spent in New Zealand. Catherine also modeled for us some interesting coats that she has made. This evening we started by presenting cheques to our chosen charities with proceeds from last year’s quilt show. with Pauline and Averil two of our founder members. We then had a very informative talk from Steve Moore from Stitchagain. Steve went through the common problems he encounters from sewists when repairing sewing machines and gave us some hints and tips on how to avoid some of these problems occurring. It was so nice to see a full house this evening I do not think there were many members who did not attend, thank you for your support ladies. We started with the AGM and then moved on to a varied display of ‘show and tell’ from our members. We saw work from our Christmas Fun Day and from various workshops which have been held during the past year and a few personal items of work, all beautifully put together. Below are items made at our Christmas Fun Day. Below is a slide show or various items made at our workshops and independently by members. We followed up the Show and Tell with a very interesting talk from the ‘Stop Domestic Abuse’ charity who came to collect a cheque for £1000 raised from the funds of our Raffle Quilt made this year. “The space between the moments”. Close up of the stitching from the above piece. Lis Showing off her ‘Blue Peter’ style progress board. Everyone working hard on their projects. Of course some just came along for some fun – which is what it was all about. A welcome break for lunch and a fun quiz. ……. and of course someone always has to do the dishes! Show and Tell at the end of the day with several projects to be completed at home, we will have a show and tell of the Fun Day projects at Decembers meeting. A most enjoyable day – thank you to everyone for helping to make this day a success. This month we welcomed Greta Fitchett who showed us her colourful reflection quilts. She explained to us how she constructs her quilts and where the ideas arise. This beautiful quilt of the Cathedral was on display at The Festival of Quilts this year. Glenis once again provided us with an interesting challenge of ’20 on a 10″ square’ we had a great response thank you to everyone who took part. We had a most enjoyable evening celebrating our 20 year Anniversary. It was so nice that our four founder members were all present along with a few members who attended the very first meeting. A delicious meal followed by an entertaining after dinner talk by Jennie Rayment with stories about her travels and quilt making workshops. There are many photos and slideshows below so please scroll through and enjoy. Committe and Members preparing and setting up tables. Earlier in the summer a few of our members helped to stretch a large quilt on a quilting frame. It was something that none of them had done before. They had an eventful day filled with fun, laughter and a delicious lunch of Amercan Hot Chicken Salad. Enjoy the photos……… *click on any photo to enlarge. Pinning the backing to the frame. Pinning the layers together and then tacking ready for quilting. Time to remove from the frame. Finished, quilted and ready for a house guest. We had a varied and busy evening this month with Pauline showing us how to make bias binding from a square of fabric, Glenis showing us her sash which is a great idea for our Quilt show next year (more details in the members area). We also had the samples on display for our Christmas Fun Day on 4 November which is being held at Westbourne again this year. Then of course the monthly raffle, many thanks Marion and Anne some lovely prizes to be won yet again. Finally, many, many thanks to Lesley one of our very talented and experienced members for bringing along her collection of vintage quilts for us to admire this evening. 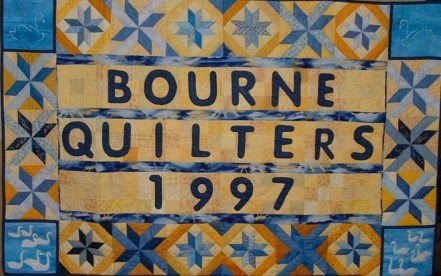 Lesley is also very keen on applique and showed her own beautiful quilts that were mainly all hand quilted along with the vintage ones with several tales to tell about how she aquired some of them. A very busy and interesting event this month. The evening commenced with lots of chat whilst we had tea followed by members show and tell. Some beautiful work is being produced ladies, well done to all who brought their work in to show us. Please bring your projects in ladies as we all like to see what our fellow members are working on. A very interesting and informative talk followed by Mandy Parkes about jelly rolls and rulers – love them or hate them Mandy gave us hints and tips on using jelly rolls and rulers, and brought along some of her completed quilts to show us. It really is very surprising what you can do with a few 2 1/2 inch strips. This evening we had the pleasure of welcoming our visitors from Scrap Happy Quilters in Gosport. We had an interesting and sometimes humorous talk from Marilyn and Brenda who showed us Some beautiful and amazing work by very talented ladies. Lots of oo’s and ah’s throughout the evening.